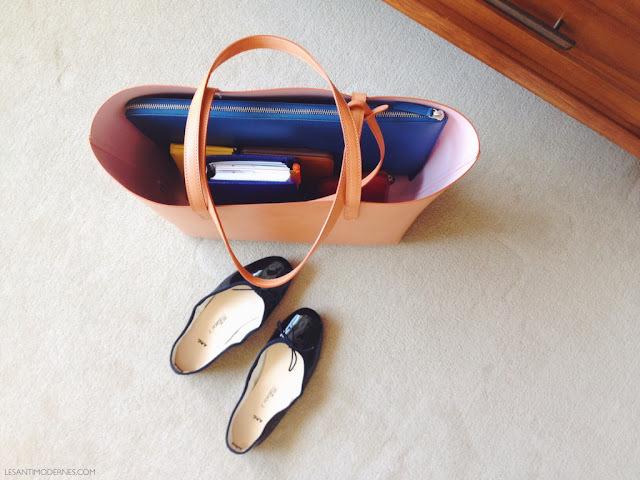 update since my last post: i bought the Mansur Gavriel tote. after some research on the different leathers, i decided to get the large vegetable tanned tote in the cammello/rosa colorway. why cammello? honestly, the last thing i need in my wardrobe at this point is Another Black Bag. also, since i started my A.P.C. raw denim project (still breaking those in! ), i've been seeking out materials with patina potential. cue to the ever crescendo-ing wave of hype and buzz surrounding MG bags over the last several seasons. a few readers and friends have bought them and recommended them to me, but since i'm generally wary of hype/It/waitlist situations, i decided to give myself a year+ to think it over before jumping into the fray. here are my thoughts on the bag. the leather: the vegetable tanned leather that MG uses on its cammello and brandy bags is what initially attracted me to the brand – it's just refreshing and fun to actually embrace all the good kinds of wear and natural patina. that said, my biggest concern was about how the leather would feel and flex. since the interior is coated, i wasn't sure if it would make the bag feel plasticky. in person the leather is definitely rigid, but it has more of a pliable structure versus a completely stiff one. the leather isn't super thick, but it's not flimsy either; the straps feel strong enough to handle what i'll throw in it. overall, the leather is lightweight while retaining a certain substance. the one issue is that the leather looked a tad dull in some areas and felt somewhat dry. to remedy this, i will be doing a bit of pretreatment and leather conditioning (stay tuned for a separate post). the design: this is where the brand has won the most fans, and deservedly so. it's really beautiful, with some of the cleanest lines i've seen from any accessories brand. i like that it's wide enough at the base to stand up on its own. the structured base also makes for easier organization of everything on the inside; i find that stuff tends to flop around bottomless pit-style in my unstructured totes. the pale pink rosa interior is a cheery accent; it also makes everything easy to spot at a glance. the small zip pouch is a nice extra; i love that it's snap-detachable to the leather strap, which you can also take off. you could easily fit an iPhone, important cards, and other small items that you want to keep in one place. 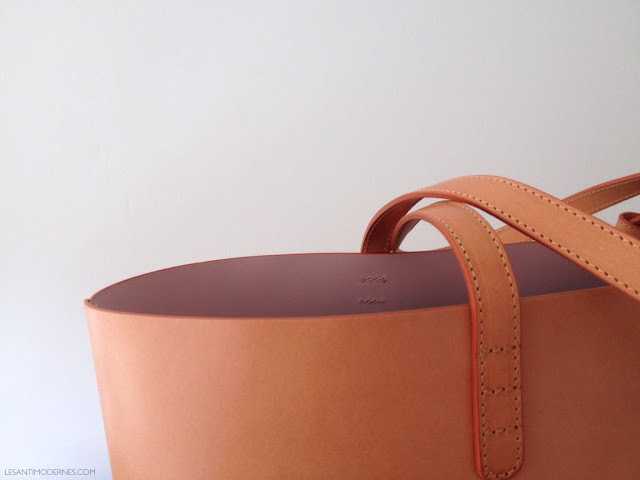 the openness of the tote is the one big negative if you like to always have a secure top closure. depending on your lifestyle, though, it may or may not be much of an issue. i see this as mainly a school tote, simple work carryall, or an easy weekend bag for strolling the farmer's market. the craftsmanship: overall i'm pleased with the sturdy feel. after close examination, i only saw firm, even stitching and clean finishes on my tote, and i would not expect anything less at this price point. time will tell if the bag is well made enough to hold up superbly after wear and tear, so i will post more updates on how it's aging as i use it. the space: plenty big for weekday, weekend, or travel without being too big. i can comfortably fit my 13" Macbook Pro in a padded zip sleeve, Filofax personal planner (an A5 planner could fit easily as well), file folders, a bulky sunglasses case, wallet, an umbrella, lunch, a large water bottle, etc. there's also room for extras like a scarf or spare pair of flats. the look: for such a spare, almost ascetic design, it packs a pretty chic, elegant punch. given the interior volume and size, it's also proportioned pretty well. i'm 5'4 and the Everlane market tote is as big as i can go on my frame (honestly it looks a bit like the portfolio size on me). the dimensions of the large MG tote are approximately equivalent to the large Longchamp pliage, but its structure somehow manages to keep it looking tidier and the most compact of the three. worth it? yes – if you're looking for a stylish yet minimalist leather tote that is, say, understated enough to be office appropriate and has a good dose of cool factor, this is a fine option. it's the Anti-It Bag It Bag. it's mostly worth the waitlist/preorder situation. i say 'mostly' because i'm generally allergic to the hassle of procuring It Items, but in this case, there are enough stockists to make the process a bit less annoying. overall, i love my new MG bag, and am looking forward to seeing how the patina evolves. what do you think? are you wishlisting anything from MG? if you have an MG bag, please chime in! 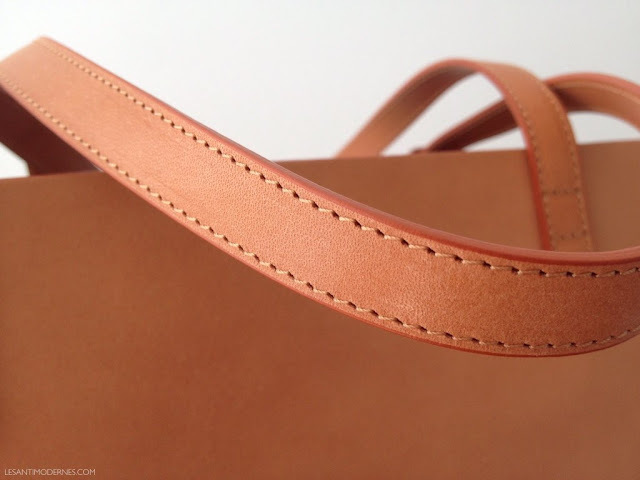 Mansur Gavriel Review Part 2: vegetable tanned leather care & maintenance. Thanks for the review. How does this compare with the Everlane bag? I've been wanting to get a tote but I'm not sure if the MG is worth the extra cost and hassle. hey Lilah - good question! the EL is definitely easier price and availability-wise. having carried the EL market for over a year i think i prefer the more compact shape of the MG (the sides don't swing out as much) for a large tote. i think the veg tan leathers that MG carries make it unique. really depends on what characteristics you're looking for. The MG bag really is beautiful. Wonderful review. I'm not fond of big bags, but the design on this one is impeccably clean. I'm still on the hunt for A Black Bag! it surprised me too - i was actually expecting it to be a lot bulkier! The patina on that is gonna look soooo gooood! No need to pre-treat! Patina, darkening and shine happens over time. I have 4 different designs and they all are the same, whether black, cammello, or gold shiny. Don't overthink scratches ;) They disappear with time and wear too. hey Olga - agree totally re not overthinking natural wear & tear. :) though i do like to do a basic pretreat/conditioning on many new bags as they often arrive feeling dry. personal preference though! i do like the ritual of care and maintenance of my leather goods. The bag looks lovely on you, Sophie! I have a bucket bag in black/flamma that I've had for almost two years now. I, too, was worried about wear on the leather as it was so smooth. And while mine has suffered minor scratches, it's in a lot better shape than I expected it to be, given that I don't "baby" it. Sometimes I think my regular-sized bucket is too big for me and that I should switch to a mini (I'm 5"3 and change), but sometimes I think the mini is too cutesy. Maybe I should just get another mini so that I have both? The green that came out with the last sale window is beautiful. The grained leather versions look lovely as well. And I do have a tip for those wanting to buy an MG, but don't want to go through the hassle of using the MG site (I hear ya). Sign up for alerts with NAP for the brand, and you'll get an email every time they get new stock. If you put an item on your wishlist, they *might* reserve one for your when stock comes in. That's how I got mine. However, the colorways are quite limited on NAP, they mostly stick with black, cammello, brandy, and, recently, navy. thanks Kat! i think the mini looks better in the backpack style, actually. i've seen pics of Sienna Miller and others carrying the regular bucket untied and it looks kind of cool like a casual vertical tote with a long strap. either way, great tip on NAP! :) i do wish they stocked more colors though. 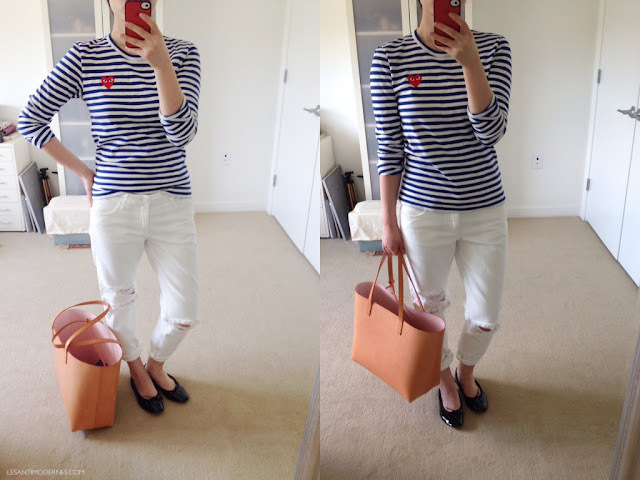 Sort of on-topic, how would you say your Everlane tote has worn in the time you've had it? Would you still recommend it? good question! 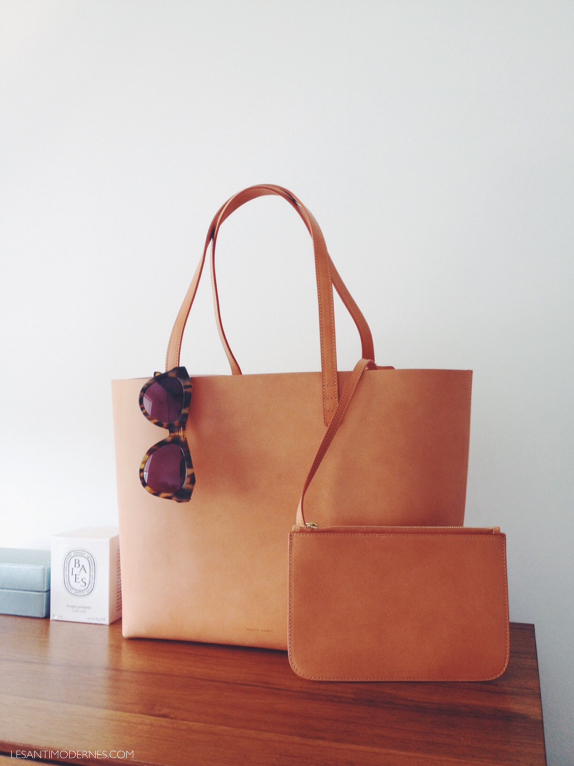 i would still recommend the EL tote due to its more affordable price point and design elements. the MG IMO has a more interesting element in the structured shape and the transformative veg tan leather, so it just depends what you're looking for. I was thinking of getting this exact bag as a school bag but the thin straps gave me pause - do they cut into your shoulders if you have a heavy laptop in the bag? I have a MG mini backpack so I know the bag itself doesn't have too much weight. Do the thin straps cut into your shoulder if you put a heavy laptop etc into the bag? Was considering getting this for a school bag. Thanks! Are you still enjoying this tote? Considering buying one and love your pictures. Also do you mind sharing your height? 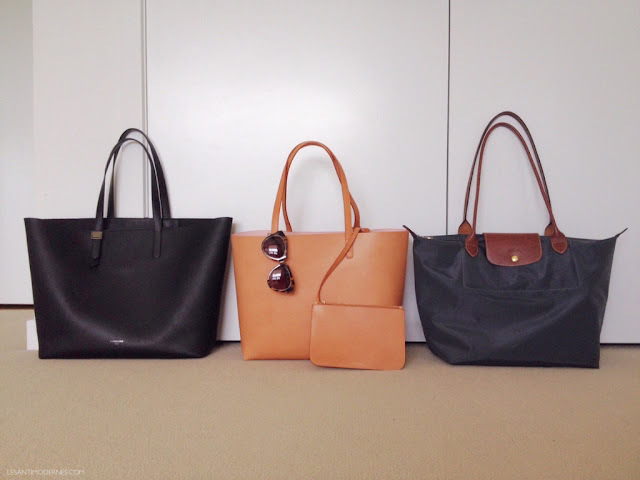 Trying to decide between large and small totes. Hi! 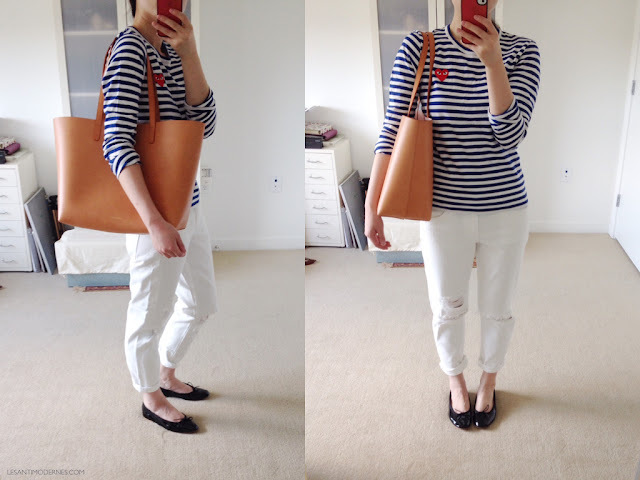 yes i am - it was particularly great this summer as a lightweight carryall. i'm 5'5 on a good day, and the L tote doesn't feel too big on my frame. Hi, i want to buy an MG tote. I am 5 ft tall, and unable to decide between the large and the small tote. Suggestions? I love the tote and the color combination! After having it for a long time, are you still happy with the quality and love the bag? Does it age well?